Sgt. Sean Rincon was met by wife Melissa, son Zen and daughter Clarissa yesterday. Sgt. Rincon was one of 58 soldiers from the 725th Main Support Battalion of the 25th Infantry Division who returned to Wheeler Army Airfield in Wahiawa. 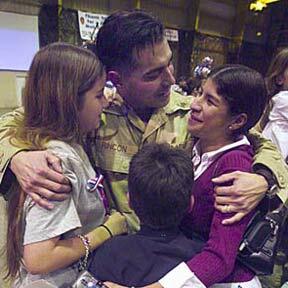 The soldiers -- part of Operation Enduring Freedom -- are the first from the battalion to return from Afghanistan.